When I lived in South Carolina several years ago, I had a friend who lived in a house with a couple of fig trees in the backyard. She had grown up in that house, and fresh figs had always been available to her for as long as she could remember. Because of this, the figs weren’t that much of a novelty to her, but I found this endless supply of supple and expensive fruit growing just a few feet away from her home an amazing concept. Those beautifully fresh and vibrant figs tasted much better than what I could find in the supermarket, and they were free. Because of this, I always grumble a bit at having to pay a few dollars for a handful of them at the supermarket, so I rarely buy them. However, this morning, I saw some really pretty black mission figs at Whole Foods that I couldn’t resist, so I picked them up and decided to pair them with shallots and walnuts for a sweet and savory roasted dish. Served with a side of simple herbed socca, this makes a perfect appetizer or light dinner. Both components are very easy to prepare and look really beautiful together fresh from the oven. Whisk together all of the socca ingredients and one tablespoon of olive oil in a small bowl. Preheat your oven to 450 degrees. Place a small cast-iron skillet in the oven during the preheating time. Remove it, and place the remaining tablespoon of olive oil into the pan. Tilt the skillet to ensure coverage, then pour the batter into the skillet. Tilt it to ensure the batter is evenly coated in the pan. Bake for 10 minutes. Remove the socca by flipping it onto a plate. Set aside. Place one tablespoon of olive oil back into the skillet. Throw in the halved shallots and roast for 20 minutes. Remove from the oven, then flip them over and roast for an additional 10 minutes. Reduce the oven temperature to 400 degrees. 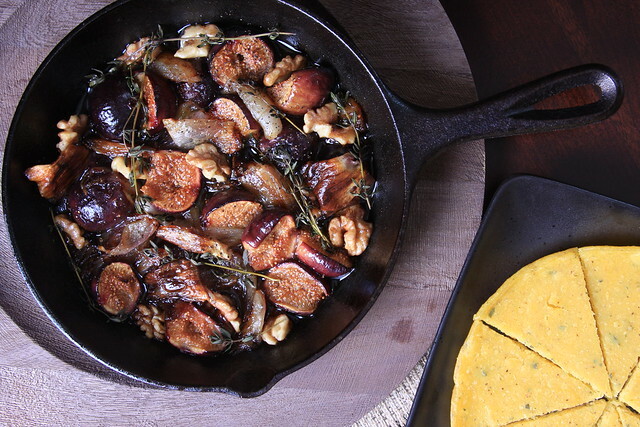 Now place the halved figs and walnuts into the skillet, and drizzle the balsamic vinegar over the top. Stir gently to combine. Sprinkle with salt and pepper and roast for an additional 10-15 minutes. During the last 3 minutes of roast time, throw in a few sprigs of fresh thyme of top. Serve straight out of the skillet with the herbed socca. Yum!! I've never had socca, but I've wanted to try it and it is GF!! Sounds perfect! I've been thinking about buying a fig tree, and I think you've just sold me on it for sure! Beautiful! I have a fig tree in my front yard, and it was the best thing that came with my house when I bought it, that, and the huge rosemary bush (way better than the washer & dryer, haha). now that dayv and i have a house, a fig tree is one of the first things i want to plant. i just love them. 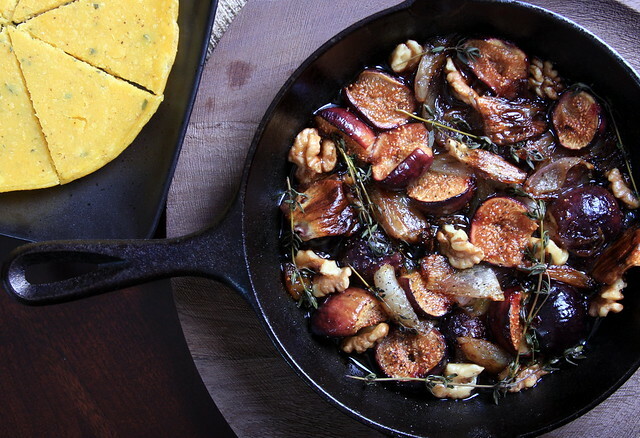 i love this light meal for a multitude of reasons, but the combination of socca, figs, and walnuts are genius. i can't wait for dinner so i can make this!! Absolutely stunning dish! Love the colors of the figs and I am a huge fan of socca! oh my gosh what an amazing dish! love the rustic beauty! figs are something i did not grow up with. i tried them for the first time when i lived with a spanish girl who LOVES then, as does dw. the years i don't pick them from a tree of a very distant relative, i buy them and i definitely feel the pinch. but it's the kind of fruit that always always is received with such gratitude and excitement, it's worth it. i've never thought to prepare it savory-style. it's beautiful! This would make such a great side dish!